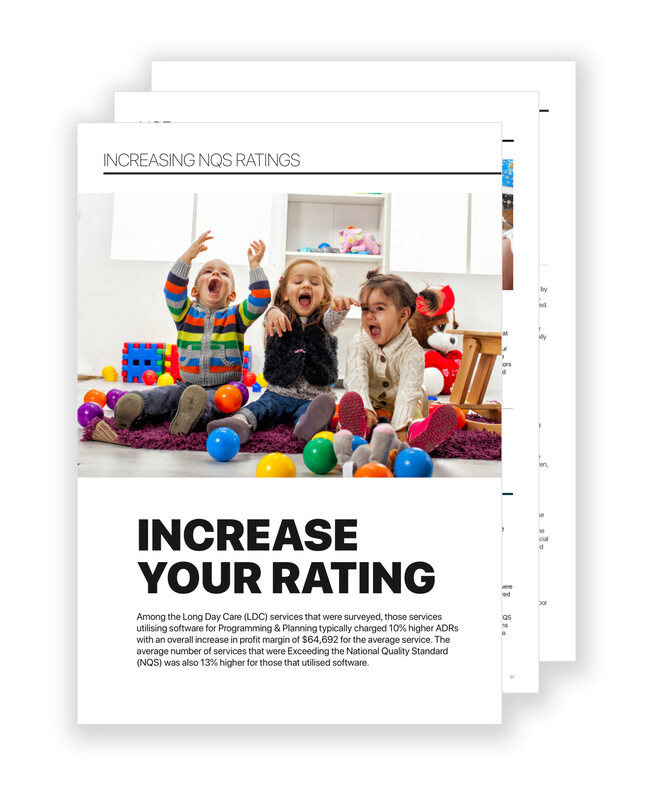 Learn how with the NQS Impact Guide for Australian childcare. Why services with ‘Exceeding’ made $322,629 more revenue. What impact ‘Exceeding’ and ‘Meeting’ have on the average daily rate. How 13% of services achieved ‘Exceeding’. Software assists in making the education that your service provides more ‘child-focused’, by allowing child observations to be easily linked to government learning frameworks and also the child’s individual learning journey. These observations can generally also link up with parent profiles keeping educators and services accountable to what they are teaching children and can then be used for future planning and the recording of learning journeys for children, which are stored safely on our cloud-based platform. Software platforms are generally designed to maximise the time an educator can spend with a child on the floor, by reducing the time it takes to complete administrative tasks, therefore improving the quality of a child’s education. Children’s health and safety can be actively monitored by parents and recorded by educators and administrators via specialised mobile apps (such as Xplor). Observations are typically time-stamped, dated and then saved in the cloud so that a permanent record is stored and is reproducible at any point in time. Children’s allergies and health plans are also generally accessible within a click of a button so that all educators are aware of a child’s specific learning and health requirements. Children’s food, sunscreen, toilet, sleep and medical events throughout the day can also be recorded digitally throughout the day. This information is typically available to parents via a web platform, which allows for educator accountability and reduces the risk of neglect for any child in care. Software assists services in being ‘well-maintained’ not only physically but in their online environments. Digital platforms can generally ensure services are government compliant through automating CCS enrolments, providing online and off-line support, as well as keeping records safely stored in the cloud (in case of audits). Going digital also ensures services are environmentally responsible by not requiring hard copy enrolment records, parent communications, child attendance rolls or Complying Written Agreements to be printed. there is a constant live update of the number of educators required in a room on the playground app, which assists with educator cross-communication and ensures that children are properly cared for throughout the service. Those services utilising software for Programming & Planning saw the largest impact was seen on staff costs, with an average saving of 15% or $95,171 per annum. Educators are able to use software to post observations of the children’s learning and development throughout their day, providing a record of the child’s learning journey, and making it easier for the educator to plan lessons into the future. The educator can also generally track a child’s wellbeing, lodging sleep, food, sunscreen, toilet and health events throughout the day. Digital records also encourage educators to maintain a high standard of care for children, as all records are available for administrators and parents to check after hours. Software allows for active participation from parents via visual and written media, as well as enabling parents to comment and like these observations. This helps parents discuss and interact with their children at home, ensuring that education is continued even after the child has left the service. This can assist in reinforcing the child’s social and communication skills, as well as strengthen the parent, child and educator relationships. Some software platforms are also an automated administrative system, designed to minimise tasks that typically take hours out of administrator working weeks (and weekends). Time is returned to administrators and educators, so they can be fully present on the floor and spend less time reporting, filing and documenting information for the service. Generally, these software programs also help in the management of tasks at the service, making it easy to roster, document and record information, improving and maintaining the consistent quality of care provided to children by educators.